The yahrzeit -- death-anniversary -- of the Biblical matriarch Rachel was a few days ago. It always falls around this time of year on the Gregorian calendar, making it relatively near to Halloween. I've always been fascinated by Rachel, and by midrash and teachings relating to Rachel. (Here's some fairly basic material about Rachel at Jewish Virtual Library.) After my miscarriage, one of my teachers gave me a piece of red thread which had been wound seven times around Rachel's tomb -- a Jewish folk-blessing for fertility and safe pregnancy. This poem owes a great deal to the teachings of Rabbi Jill Hammer. See Cheshvan | TelShemesh, particularly the sections on 11 Cheshvan (Rachel's death-anniversary) and Other Paths. All feedback welcome. Happy Halloween to those who celebrate. I think I started reading Susan Palwick's blog after I finished my intensive unit of CPE (Clinical Pastoral Education) at Albany Medical Center. I did my unit of CPE during my first year of rabbinic school, so this was a while ago. I remember that I came to hospital chaplaincy work with deep trepidation: would I be up to the task? What if I couldn't do, or be, what was needed? To my surprise, the work transformed and uplifted me, maybe especially my nighttime visits to the emergency department or E.D. A friend pointed me to a blog post I'm profoundly glad to have read: The first four ED sonnets, a quartet of sonnets written by Susan Palwick about hospital chaplaincy work. If you enjoy formal poetry -- and especially if you have any connection with chaplaincy work, or its cousins social work, counseling, and medicine -- don't miss these. Some six years later, those sonnets -- part of an extraordinary book-length sonnet cycle -- form the collection Brief Visits: Sonnets from a Volunteer Chaplain, published by the Texas Review Press. Susan Palwick's poems remind me what I most love about hospital ministry -- in her words, 'story understood / as sacrament.' Here are the small mercies and outsized emotions of a night in the E.D., the infinity of human stories unfolding. 'These small rooms bestow / huge gifts,' she writes, 'God's strangeness shining from each tale(.)' These patients are fortunate to have Susan's presence, a manifestation of God's caring hands and listening ear; and we are fortunate to have her poems, which encapsulate our sweet, painful, poignant human lives. I'm not sure I can offer a better review than what I said in that paragraph. There are so many shining moments of laughter and grief in this collection: the patient admitting "I don't know how to pray / right now," the realization that in the emergency room people suddenly become grateful for outcomes they would never have wished for ("'he's on a ventilator' better news / than 'nothing worked,'") her description of the hospital chapel ("it's almost always empty when I come/ I'm almost always empty, which is why / I come") which reminds me so much of the hospital chapel I used to visit sometimes at AMC. These are powerful and poignant poems. Reading them, I feel lifted out of myself in much the way I used to feel when I walked the hospital's halls, in much the way I feel when I enter into real I/Thou relationship with a congregant or a stranger who seeks pastoral care. I recommend this collection highly. If you're clergy, if you're a chaplain -- or if you've ever felt mortal, alone, uplifted, or afraid. Hospitals are holy places because there we connect with some of our deepest human experiences: birth and death, mortality and fear, joy and exaltation. These poems bring all of those to life. Get the book online: Brief Visits on Amazon. When one lives inland, as we do, it feels strange to be preparing for a hurricane. Last year, when Hurricane Irene appeared, we'd already been planning a summer party for that late-August weekend. We went ahead and threw the party; why not, right? We live on a mountaintop, which should be relatively safe from flooding -- and why not have friends nearby as we rode out the storm? Ethan tarped our most vulnerable windows and screwed plywood down. We cooked huge bowls of noodles and wheatberry tabouli, foods which can be eaten safely and tastily even if there is no power. And then we fired up our outdoor wood-fired hot tub and sat outside in the glorious steaming water as the rain began to fall. We were blessed. We came through that storm unscathed. We didn't even lose power. But others in our neck of the woods were not so fortunate. The Spruces trailer park in Williamstown, home to most of that town's elderly who are living on fixed incomes, flooded and some 200 people became homeless. Roads and bridges washed out. Just north of us, in Vermont, there was tremendous devastation. Now everyone in New England is battening down the hatches in preparation for Hurricane Sandy. The forecasts are fairly alarming. Here at our house we've secured a tarp over the top of our ger, flattened our folding deck chairs, moved outdoor lanterns inside. I've cooked all the perishables I can, trying to make foods which will be relatively safe to eat at room temperature if we lose power, which I assume we probably will -- high winds plus trees which still retain some fall foliage means power lines will definitely come down. I've poured several pitchers of water, because losing power means losing our well pump. I've made two pots of coffee. I'm trying to do laundry while there's still power to do laundry with. My shul has canceled Hebrew school for today (all of the public schools in our area have closed, and Drew's preschool will close at noon) and I've put out a message encouraging members to prepare for the storm and to check in with each other, especially with those who are older, living alone, and/or especially vulnerable. I'm caught between the inclination to refresh weather.gov and wunderground.com incessantly (while I still have internet and power) and the awareness that keeping an eye on the storm's movement doesn't actually help me or anyone I might be worried about who lives in its path. I think we're all a little bit manic today, a little bit on-edge, knowing that something potentially terrible is coming and powerless to stop it or to truly predict what the future holds. And the sages in the Gemara of Talmud Yerushalmi go further and say that haShem would take a strong wind and lessen its force as it passes through mountains and hills, because God made wind, His breath, to make life, not take life. I've always loved the fact that our tradition instructs us to offer blessings even at moments of difficulty and fear. It would be easy to respond to the might of a hurricane with curses, but the sages of the mishna argued otherwise. Strong winds and driving rain can be a reminder that there is a power in the world greater than we. Hurricanes are awesome in the original sense of the word -- awe-some, awe-ful, awe-inspiring; reminders of the awe we experience when we contemplate the infinity of the God Who creates them. This is a storm unlike any we've seen before because the earth is doing things it has never done before. The water along the Atlantic coast is 5 degrees hotter than usual, super-charging Sandy's rainfall, and drawing the strength of the storm further north. Already too-high tides will be pushed dangerously higher by this storm. Despite these rapid changes, our politicians have dropped climate from their agenda. So, in addition to preparing to stay safe, let's prepare to connect the dots between this storm and the over-burning of fossil fuels. We need to put climate change back front and center in the public conversation. I appreciate his reminder that the ferocity of the weather conditions we are learning to take for granted has a great deal to do with the choices we have made about how to live on this earth. The sages of our tradition instruct us to offer blessings even when faced with a mighty storm -- but I doubt they could have pictured a future paradigm in which we understand ourselves to be co-creators of our planet's climate conditions, as many of us now do. A storm like this one is a reminder of God's infinite and awe-some power -- and also of our own role in creating a planetary system where ice is melting, currents are changing, and a summer of searing drought is followed by wind and rain we can't help but fear. May we all be safe. May we all be dry and comfortable. May no one lose power; or, when we do, may we have enough to eat, a roof which keeps us dry, the companionship of family and friends. May no one else die because of this storm. And when we reach the other side, may we all take whatever steps we can to mend what is broken and to help those in need. Count the eighteen rabbis of this year's Rabbis Without Borders fellowship among the people whose lives are being disrupted -- though thankfully in a minor way -- by Hurricane Sandy's projected path: our first cohort meeting, which was meant to begin on Monday, has been canceled. We don't know yet whether we'll add these days (and their planned program) to our December meeting, or to one of the winter / spring meetings, but one way or another, we're not convening in New York City tomorrow night through Tuesday. I know it's a wise decision; I'll be grateful to wait out the storm at home in western Massachusetts with my son. And I look forward to meeting my fellow RWB fellows, jolly good fellows as we all surely are, when our December meeting rolls around. Early next week, I'll be blessed to take a two-day trip to New York City for the first meeting of my cohort of Rabbis Without Borders rabbinic fellows. Rabbis Without Borders does a variety of things "to nurture and develop a network of rabbis who share a common vision: to make Jewish wisdom accessible in order to enrich people’s lives across religious and cultural borders in America." RWB is a program of CLAL, a leadership training institute, think tank, and resource center founded in 1974 which has done a lot of good work around religious pluralism and inclusivity. The RWB Fellowship helps rabbis develop and communicate a Judaism that can compete in a globalized, networked world in which identities and communal boundaries are increasingly permeable. By participating in the RWB Fellowship, rabbis learn how to use Jewish wisdom to speak to contemporary American issues, how to use language that is open and inclusive to reach a larger audience, and how to use Jewish wisdom to add meaning to people’s lives. For more, I recommend their FAQ: What is a Rabbi Without Borders? A rabbi without borders is "deeply pluralistic and always aware of the partial truth in a view with which we deeply disagree," "doesn’t worry, at least not very much, about dilution or work from a narrative of erosion," "is personally evolving and experiences that evolution as a coherent process, not as a betrayal of past conclusions." (Among other things.) I'd like to think that those add up to a reasonable description of who I try to be. Jewish Renewal is explicitly transdenominational. My classmates in ALEPH, and my teachers as well, came from backgrounds including Reform, Conservative, Reconstructionist, Orthodox, Hasidic. It's one of the things I love about learning in ALEPH and being part of the ALEPH community. When I went to my first PANIM inter-denominational rabbinic student retreat (a program which is now run by Clal/RWB), I loved having the chance to learn and daven and connect with students from across all of the different streams of our tradition. This fellowship offers a similar opportunity. I'm looking really forward to meeting the rabbis in my cohort and to seeing what we can learn from and with each other -- and what I can bring back, over time, to my congregation; to Velveteen Rabbi readers and commentors; and to all of the interconnected communities I aim to serve. Fjords is keeping the shine on our cutting edge literature by publishing Denmark's pre-eminent postmodernist writer Josefine Klougart translated by Alexander Weinstein. Five first time English prose pieces translated by Alexander Weinstein will appear alongside the original Dutch. We keep the eye engaged by focusing on portraiture with nine different fine contemporary portrait masters including Kehinde Wiley, Susan Makara, Margaret Bowland, Carlos Gamez de Francisco, Cobi Moules, Lita Cabellut, Tun Ping Wang, Sharon Matisoff and Gaele Erwin. The prose of Nate Liederbach and Shivani Meta complement our poetry feature Ronald Wardall (1937-2006) and work by Crow Billings, Jessica Dawn Zinz, Tara Mae Mulroy and others. A short by Phillip Neel and another by Phillip Kobylarz are the short story selections for our fall issue. I particularly like Nate Leiderbach's "Habits of Destination," Shivani Mehta's "The Collector," and Carol Carpenter's "The Last Night of the Year," though the whole issue is excellent, and it's neat to read the Danish work in translation alongside the (to me mostly opaque) original-language text. In any event, I'm honored to see my own work in these pages. For more information: About Fjords; subscribe to Fjords. My thanks go to the editors for including my poems in such a lovely journal! Earlier this week, Anat Hoffman was arrested for daring to wear a tallit and to pray the shema at the Western Wall. Above: video (Hebrew) of Anat Hoffman's arrest. If you can't see the embedded video, you can go directly to it at YouTube. Coinciding with this month’s Rosh Hodesh celebration is the huge Hadassah Convention blanketing the city. Although it would have been optimum to have the Hadassah women join us on Wednesday morning for the service at the Kotel, there was a scheduling glitch and thus they descended upon the Western Wall at 11 p.m. on Tuesday night. The evening program consisted of a warm welcome from Anat Hoffman, founder and current chair of Women of the Wall, followed by Hebrew songs, led by volunteer Rabbinical students. When the WOW members and volunteers arrived at the women’s section of the Wall to prepare for the Hadassah contingent, the police and authorities surrounded us. They were harsh in their demands that we could pass out NOTHING, not even the song sheets we had prepared. So when the Hadassah women did arrive, Anat delivered her welcoming remarks and then we all started chanting the Shema, probably the most common prayer in our daily ritual. Immediately a policeman approached Anat and arrested her for disturbing the peace. To say that we were all shocked is an understatement. We know that there are issues with ultra-Orthodox men opposing women who don prayer shawls and skullcaps and pray out loud, but this was beyond our imagination. Anat was handcuffed, detained overnight, and eventually went before a judge on Wed. afternoon. She was ‘sentenced’ to a 30 day period in which she is not allowed at the Kotel. I admire Women of the Wall tremendously. As I've written before (most recently in 2011: Pluralism, prayer, and Women of the Wall), I'm not entirely comfortable with the extent to which the Kotel (the Western Wall) is treated as though it, itself, were innately extra-special-holy -- but as long as the Kotel is regarded as a central holy site in Judaism, it should be a place where people of all genders can pray, and not only in the ways regulated by Israel's Orthodox rabbanut (rabbinic authority.) Judaism belongs to all of us, prayer belongs to all of us, and the Kotel belongs to all of us. Shame on those police for arresting a woman because she dares to say Judaism's most central daily prayer aloud in one of Judaism's holiest places. Shame on the system which allows only certain, Orthodox-approved, modes of Jewish prayer at the Kotel. More importantly, though: kol hakavod (all the honor) to Anat and her colleagues for asserting our right to pray our beloved prayers aloud, wearing the ritual gear which is appropriate to our practice, at this place which has for so long focused and concentrated the prayers of Jews around the world. Anat is an inspiration to me, and so is everyone who davens with Women of the Wall. I look forward to the day when religious pluralism is as alive and well in Israel as it is here in the Diaspora. When I lay tefillin and wrap in my tallit later this morning at my shul, I will feel extra gratitude that I live in a place where I can pray aloud, in my ritual garments, without fear. May the same become true for my Israeli family and friends, speedily and in our day. "Do you smoke?" the doctor asks as he peers into my ears. "No," I tell him, truthfully. For a moment I wonder: does he mean what are my vices, if smoking isn't one of them? But then I realize he's probably not fishing to find out whether I have a beer with dinner. "You mean, professionally?" I ask. He nods. "I'm a rabbi." "Good for you," he says, absently, and presses the stethoscope to my back. "Breathe like this," and demonstrates how he wants me to inhale and exhale. So I do. "My youngest daughter and her friends used to play dress-up," he informs me. "They would go up to the attic and get prom dresses, of which we at one time had quite the collection, and they would play all sorts of games." I make some noncommittal sound and he continues. "Sometimes they would play wedding. One of them would be the bride. Another would be the minister. They'd throw flowers. You know how it is." Perhaps noticing the question in my eyes, he detours for a moment to say, "this has nothing to do with your sinuses," and then he goes on with his story. "Not long ago I went to a wedding in Lenox, at the little church there. One of my daughter's childhood friends was getting married, and the minister was another one of the girls who used to play wedding in our yard." Okay, I say, prompting him to continue. "It was so beautiful," the doctor tells me, earnestly. "The bride was all grown-up. I think she's going to be a lawyer. And the homily was poignant and well-written. And I realized, these aren't little kids playing dress-up anymore! This is real life. And maybe," his voice is wistful now, "they really will carry something forward." I'm not sure what he means, but I think it's something like: maybe the lessons we hoped we were teaching our children really got through. Maybe they'll make a better world than we did. I imagine what it will be like when Drew is old enough to be thinking about marriage. When his little buddies from preschool are standing beneath the chuppah or at the altar. It's impossible to picture, but I know the day will come. "That's beautiful," I tell him. "Anyway, you're fine," he tells me in response, tone entirely businesslike again. "No sign of anything bacterial. Stick with the over-the-counter stuff." I shrug. "Okay. I'm mostly just here because I've had a cold for a month and my husband said, 'you've had a cold for a month, go see a doctor!'" He laughs. "Keep it up," he tells me, and opens the door. I'm pleased to be able to say that another of my mother poems has been published. My poem "Besieged" appears in volume #81 of Earth's Daughters. The issue's theme is "Both Sides Now." It's an honor to see my work in these august pages. This is a print publication, so I can't link you to the poem online, but it's a beautiful journal -- if you're interested in supporting womens' voices and longstanding literary journals, Earth's Daughters might be for you. Here's subscription information. Sky and wire. Outside the local jail. I've driven by the Berkshire County Jail and House of Corrections for years, but until this fall, had never set foot inside. I had thought that it only housed people who were awaiting trial, for a matter of months at most. (Among other things, it's called a "jail," not a "prison," and in my understanding the distinction has a lot to do with duration of stay.) But it turns out that many of the 400+ men incarcerated there are there for two to five years. This facility was build in the late '90s, and dedicated in 2001; it replaced the old jail on Second Street which had been built by Civil War veterans in the late 1800s. By the time they moved out of the old jail, it was housing twice as many men as it was built to hold. I was called in some weeks ago by the minister who manages pastoral care at this county jail. Two of the inmates had expressed the desire to see a rabbi and had articulated an affiliation with Judaism, so the pastor called me. Shortly before the Days of Awe, I met with him and we chatted about my experience working with inmates. (Short answer: very little, though when I was a chaplain in Albany, I did occasionally enter the locked hospital ward to minister to prisoners who had been hospitalized.) After my application was approved by whatever agency makes decisions about who's permitted to tend to ibmates, I made an appointment to see each of the men. I'd never actually been inside a house of corrections before, so the logistics of the process were interesting to me. I put my things in a locker, gave my ID to the officer in charge, stood still for an ID photo, waited for the big metal doors to clang open so I could enter the locked corridor, waited for them to clang shut behind me and for the next set of doors to open, entered the visiting room which was faced with a set of mirrors which I'm guessing were one-way glass. I couldn't help filtering the experience through the lens of books I've read, from asha bandele's The Prisoner's Wife to Ted Conover's Newjack. After a short wait, the first man entered the visiting room. While we met, another inmate received a visit from a woman and a toddler; they took seats at the far end of the room, and we tried to ignore each other, to give each other as much privacy as possible. I met with each of the inmates who had requested a rabbi, one at a time. Neither of them was born Jewish, but both have felt an interest in Judaism and a pull toward Judaism since their incarceration. As far as I know, they are the only Jews, or would-be Jews, at this house of corrections. With each of these men I talked about Judaism, about their lives, about what makes them interested in this tradition. We talked a bit about Torah and a bit about prayer. Both of them have active personal prayer lives, and talk with God daily. I promised to send them Reb Zalman's translation of the prayer for forgiveness recited as part of the bedtime Shema. They asked about what's involved with conversion, and about Jewish congregations in Pittsfield which they might visit upon their release. Both of the men are local, so they're able to receive regular visits from family. I get the sense that this is a tremendous blessing -- though also sometimes difficult. 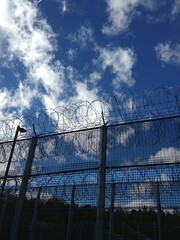 One inmate spoke with me about the challenges of maintaining his relationship with his girlfriend. They run up enormous phone bills each week (the prison charges a few dollars for each call, even if it only lasts for seconds) and they argue, sometimes. It's hard for her to understand what his life inside is like. It's hard for him to imagine all of the choices and changes which face her while he's in. I don't know whether either of these men will pursue affiliation with Judaism in the long term. Perhaps this will be a comfort to them while they're inside, and once they return to the ordinary world they'll discover that the pull was temporary. Or perhaps their yearning to connect with Torah and to be part of the chain of Jewish generations will sustain them through their time in jail and into their lives afterwards. That's not for me to know. I'll do what I can to minister to them, regardless. It's a humbling opportunity. I'm looking forward to further conversations, and to this new way of being of service to people in my community who are in need. We've entered parashat Noach. This week's parsha contains the story of the great Flood! There's a lot of good stuff in this week's Torah reading. He was blameless in his age. though his era was lawless. and the earth became corrupt. he found love in Na'amah. Read the whole thing: Blameless. 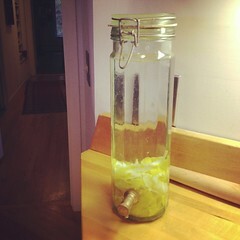 Earlier this week I got this year's batch of etrogcello underway. But what to do with the etrogim after I'd carved away the yellow part of the peels? This year's answer is candied etrog. I found two recipes which looked interesting. 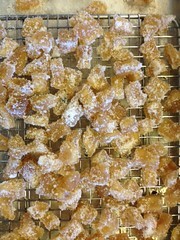 One comes from chef David Lebovitz: candied citron. The other is this dulce de etrog recipe. I diced the peel and soaked it overnight in water, then replaced the water and soaked some more. I brought it to a simmer, drained the water, and then put the etrog in a heavy-bottomed pot with water and sugar. Then I clipped on the candy thermometer and let the peel-sugar-water mixture simmer until it reached 230. Once we hit that magic number, I removed the pot from heat. David's recipe suggested letting the peel sit in the syrup for an hour, so I did that. I had planned to then remove the peel and drain it, but after an hour I found that the peel-and-syrup mixture had hardened into a kind of jelly, so I went with the dulce de etrog recipe's suggestion of spooning the mixture out onto a sheet of parchment paper to rest overnight. I rested it in the fridge, mostly because we sometimes have ants and I knew they would find it if it were sitting out in the kitchen. In the morning it was lovely and stiff from the cold. I cut it into little pieces (the jelly became softer as it warmed, but remained jelly-like, never melting altogether) and rolled them in sugar. 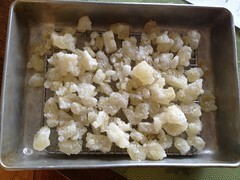 Candied citron / dulce de etrog. The end result are pieces of etrog candy of varying shape and size, now drying on a drying rack. I'll seal them in an airtight container later today. The candies are sweet and citron-y, but not bitter. They're delicious. Unlike the etrogcello, these won't keep for a long time. We'll probably feed them to this weekend's houseguests. I feel good about finding a way to use, and savor, these precious and rare fruits. A little taste of Sukkot now that Sukkot is only memory. And I still have two more etrogim to use! I think I might try spicing these with star anise and peppercorns, as in this Pierre Herme recipe. Yum. These slivers of etrog peel will rest under vodka in the dark through the winter. Shortly before Tu BiShvat, the New Year of the Trees, I'll strain and sweeten the results: maybe with splenda syrup, as in previous years -- or maybe with local honey, as my friend Bob does. We'll sip the bright home-made limoncello at our Tu BiShvat seder, a link between this autumn's harvest and the first stirrings of the coming spring. I let my prayerbook get dusty. is an overstuffed red chair. I count the hours until bedtime. only soothe for a little while. of the first human heart. I'm not sure why depression has played a role in two of the three Torah poems I've written for parashat Bereshit. (This one, and Postpartum, 2008 -- the other one I've shared here is Likeness, 2009.) Maybe it has to do with the natural let-down after the wild cascade of holidays we've just completed. Though the phrase "milk and honey" may make you think of the Promised Land which is described in those terms, the Torah is also likened to milk and honey -- in Song of Songs we read "Honey and milk are under your tongue," and this is one of the reasons for the tradition of eating dairy on Shavuot when we celebrate the revelation of Torah. I'm not sure I'm wild about the line "a hint of the original void." I wanted to suggest tohu va-vohu, which I've seen rendered "formless and empty" or "wild and waste" or "astonishingly empty." (Perhaps the most interesting rendering is Sforno's; he reads tohu to mean potential and vohu the ability to become real.) I like the idea that our moments of depression offer us a glimpse of the formlessness which preceded all things. As always, feedback is welcome! And if you like this poem / this kind of poem and you don't yet have a copy of 70 faces (Phoenicia, 2011), I hope you'll consider picking one up. Anyway, she recently launched a series of posts about Esther, beginning with Esther Actually: Princess, Whore...or Something More. (I also quite like her post Esther Actually: Purim, Persia, Patriarchy.) Most of her readers, she tells me, are evangelical Christians, and she wanted to counter some of the disturbing ideas about Esther she's seen promulgated in the evangelical world. She asked whether I would be willing to write a guest post, a few hundred words about what Esther means to me as a Jewish woman and as a rabbi. Read the whole thing here! Esther Actually - Rabbi Rachel. Thanks, Rachel, for opening your doors to another Rachel. And to anyone who finds your way here from Rachel Evans' blog, welcome; take a peek at the VR comments policy; feel free to browse the "greatest hits" posts in the sidebar (here are excerpts from my favorite ten posts from last year); and I hope you'll stick around.